In the the third stage of the partner journey, Decision, solution providers have narrowed down their options in products, technologies and/or vendors. Now it’s time to decide. How can you make them decide to pick you? Start by taking a closer look at the components of the decision. The solution provider respondents in our annual State of Partnering study* report the sales team and the CEO have the most influence in this phase, with the CEO making the final decision. In larger solution providers, the VP of the tech sector (the individual running the business unit around the set of technologies) makes the final decision. From the very beginning, the sales team has been instrumental. The tech team (systems engineers and solution architects) wields the next highest level of influence in the decision-making process. This isn’t surprising considering the importance of a technical evaluation. On the vendor side, while the Partner Manager is engaged in the evaluation of prospective partners in the previous stage, the VP of Channels or Director of Channel Sales now makes the final decision to bring on a prospective partner. We encourage vendors to design and document a smooth transition process between the primary responsibilities in the Consideration and Decision stages. This ensures the opportunity with the prospective partner is clearly communicated to the executive making the final decision. Many vendors rely on their Partner Relationship Management (PRM) system to process the transition between stages. This works well if the PRM solution is robust enough to capture and display the evaluation metrics and insights in a scorecard or dashboard format. What makes a partner pick you? With decision-makers identified, it’s time to make the call. At this point, the solution provider criteria have morphed a bit. Technical capabilities now outpace all other elements in the decision to bring on a new vendor. The solution provider sales rep might have liked the response from the vendor channel manager, but if the vendor can’t pass the technical standards, no dice. The technical evaluation includes functionality review, performance assessment and compatibility with other products the partner has adopted. Most solution providers have a rigorous and well-documented process for a vendor technical evaluation. Just ask. Vendor stability ranked as the second highest priority for the solution providers in the Decision phase. Stability can mean many things, including low channel executive turnover, consistent behavior in support and service situations and dependable and predictable communications and actions. This doesn’t include installed-base demand or even brand recognition, both of which are farther down on the solution provider priority list. Partners are looking for a feeling of steadiness. 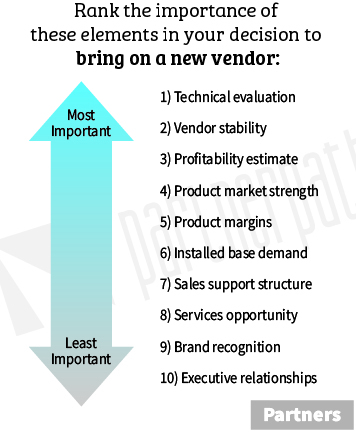 Unfortunately, there isn’t a checklist we can offer vendors to ensure success with this subjective assessment. An estimate of their profitability with a vendor’s products ranked third. Profitability covers a lot. It can be everything from enablement and sales cycle expectations to financial elements to the ability to access support and provide value-added services. About three years ago, the solution provider respondents shifted from a general understanding or feeling about their profitability with a vendor to systematically calculating profitability per vendor line. Product margins is an element we pulled out and measured (it ranked #5 in importance) and it is also part of this profitability calculation. When we asked the partners what program elements (other than margin!) are important to their decision to work with a vendor, the results were predictable. Look at the emphasis on support highlighted in the Consideration phase and check out our 6 Pillars of Partner Experience report. Technical support, pre-sales support and technical training were the top three program elements the partners cared about (again, other than margin) with sales training and customer service rounding out the top five. These program benefits point to the partners’ priorities of training and support, enabling them to be successful selling, implementing and maintaining a solution for their customers. 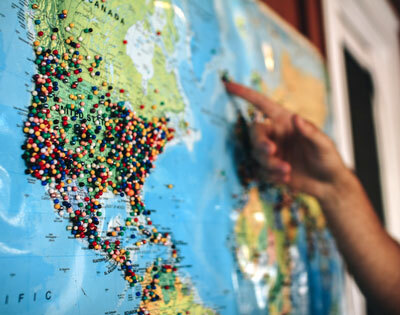 Subscribe to our blog to keep learning about the Partner Journey. The next stage is: Experience. *In December of 2017, we surveyed 104 vendors and 220 solution providers on the people involved, priorities and expected outcomes of the partners’ journey. Ask your prospective partner for their technical evaluation process and expectations. They’re likely to have this documented and might even share it with you. Connect at a senior level with the CEO of the solution provider. This is the ultimate decision maker. It wouldn’t hurt to have your Channel Chief reach out and connect directly, or possibly even break bread if you can manage an in-person visit. Be consistent and proactive with the partner as they go through the evaluation and decision. Ensure clear and timely communications both internally as you consider the partner’s fit in your ecosystem and externally with the partner as they’re evaluating you. Invest in enhancing training and support elements of your program. Remove as many financial and process hurdles as possible to provide access to these priority elements.